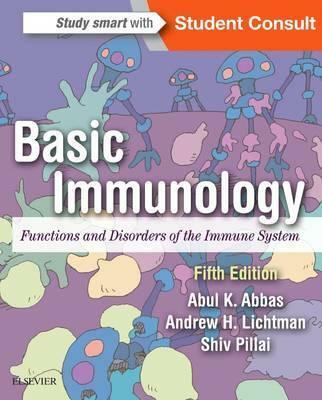 In this updated edition of Basic Immunology, the authors continue to deliver a clear, modern introduction to immunology, making this the obvious choice for today's busy students. Their experience as teachers, course directors, and lecturers helps them to distill the core information required to understand this complex field. Through the use of high-quality illustrations, relevant clinical cases, and concise, focused text, it's a perfectly accessible introduction to the workings of the human immune system. Concise, clinically focused content is logically organized by mechanism for efficient mastery of the material. Features an appendix of clinical cases and CD molecules. Includes numerous full-color illustrations, useful tables, and chapter outlines. Focus questions within each chapter are ideal for self-assessment and review. Key points bolded throughout the text make it easy to locate important information. Presents information in a format and style that maximizes usefulness to students and teachers studying medicine, allied health fields, and biology. Fully updated content equips you with the latest relevant advances in immunology. Revised and updated artwork enhances your visual learning of important principles and reduces the excessive factual details found in larger textbooks. Twelve brand-new animations available on Student Consult help further explain complex concepts. Student Consult eBook version included with purchase. This enhanced eBook experience gives you access to the text, figures, images, glossary of immunology terms, self-assessment questions, and references on a variety of devices.